To pursue the goal of reducing our direct environmental impact we carry out constant work on our property which, as well as reducing consumption, also improves the wellbeing of those that work there. To this end, environmentally friendly criteria are applied whenever possible, with special attention focused on energy saving, limiting greenhouse gas emissions and on the materials used. Our goal is to create a new lifestyle that is more respectful of the environment and attentive to people’s needs by leveraging on our professionalism, experience and technological innovation. 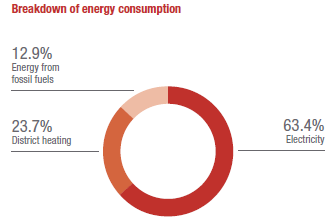 As regards energy consumption, in 2013 we consumed a total of 824,214 Gigajoules, equal to 25 Gigajoules per capita (-5.4% compared with 2012). Starting this year, we have decided to calculate per capita energy consumption as the ratio of total consumption to the total number of workstations occupied at the sites monitored in the EMS. Electricity accounts for the large part of the Group energy consumption: 145,104,835 kWh was consumed at our sites in 2013 with a per capita consumption level of 4,328 kWh (-7.2% compared with 2012). The total consumption also includes the electricity consumed by the Data Processing Centres (DPC), certainly one of the biggest sources of electricity consumption within the Group, other areas including lighting, the operating of machinery, air conditioning and, in some countries, heating. In 2013 the DPC’s consumed a total of 25.4 million kWh (-10.9% compared with 2012), equal to 17.7% of the total. Of the various structures, the Mogliano Veneto Centre (Italy) is the most energy intensive also because - like the DPC in Germany - it carries out marginal activities on behalf of Group companies in other countries. In order to cater for the energy consumption of the DPC in Mogliano Veneto, a natural gas-fuelled trigeneration plant was developed that makes it possible to produce combined power, heating and cooling energy with notable savings in terms of consumption. The plant became fully functional in December 2013 producing 1,330,560 kWh. In the immediate future, the energy produced at the plant should be enough to meet all of the energy required by the Mogliano Veneto complex. In recent years, various measures have been implemented to reduce the amount of electricity consumed in our DPC’s. For example, the cold corridor system is used which requires the machines to be set up in a line so that only the corridor has to be cooled and not the entire room. New, less energy-intensive machines have also been introduced and there has been a switch to new virtualisation systems. The introduction of the latter has also made it possible to manage the surfaces and the spaces dedicated to the DPC’s more efficiently. In recent years there has also been a major increase in thin client workstations, whereby all users use the same server with estimated electricity savings of 10%. In order to reduce environmental impact, we have also made a commitment to increasing the use of electricity from renewable sources which, as mentioned, currently account for 76% thanks mainly to the efforts of Germany and Italy. In Germany, the certification body TÜV SÜD certifies that all electricity used comes from a hydroelectric source, while in Italy the electricity consumed at all sites is offset with CO-FER certificates, which attest to the renewable origin of the sources used by plants for the production of electricity. 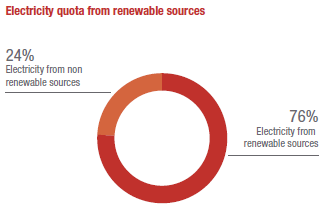 36.6% of the energy consumed at EMS sites derived from the consumption of fossil fuels (natural gas and diesel oil) and district heating to heat the work spaces. Natural gas is the most widely used fossil fuel by the Group companies (2,406,114 m3), while diesel oil is used increasingly less often. In 2013 only 343 m3 of diesel oil was used (-18.6% compared with 2012) thanks to the gradual replacement of diesel oil boilers with next-generation condensing gas boilers, a process that has almost been completed. In terms of heating and cooling systems, wherever possible attempts are made to use environmentally efficient technologies such as ceiling or under-floor systems or direct expansion systems, such as heat pumps. In recent years there has also been greater use of building envelopes and other energy saving solutions such as insulation and thermal doors, external temperature detectors, thermostatic valves and thermostats. In many sites we have installed movement sensors or clocks/ timers for controlling the switching on/off of lights and heating and air conditioning systems. We always seek to replace used light bulbs with energy saving light-emitting diodes. As part of the Progetto Efficienza e Sostenibilità relating to its property, Generali Real Estate has taken a series of measures (and others are ongoing), installing light fittings with LED (Light Emitting Diode) technology in its offices. This technology, which represents the near future of lighting in buildings, is undergoing continuous development as regards its light efficiency (lumen/Watt) and makes it possible to obtain notable electricity savings, reducing electrical power by around 50% on a like-for-like basis in terms of the number of hours the systems are used for. In addition to this, the fact that LED bulbs last over twice as long as traditional fluorescent bulbs means that there are also financial savings to be made. Generali was one of the first companies in Italy to use LED technology not only in the common areas of buildings but also in the offices in which its employees and consultants work. More specifically, at the Mogliano Veneto site around 21,000 fluorescent tubes were replaced with an identical number of LED tubes, resulting in a 45% reduction in the amount of electricity required for lighting, an approx. 85 MWh reduction in the amount of electricity consumed for air conditioning in the summer, an annual saving of around 100,000 euro and a consequent ROI timeframe of around 4 years. In Italy, the implementation of the Progetto Misura continues with the aim of installing devices to measure electricity, natural gas and water in the various self-used and investment properties in order to continuously monitor the performances of the buildings and take prompt action in the event of any anomalies. Similar systems have also been installed in some buildings in France and Germany. We believe that energy certification and sustainability assessment are very important for measuring the energy performance of the systems and identifying possible areas for improvement. For this reason, in Austria the majority of buildings have Energieausweis energy certification attesting to the energy performance of the building, while in France the majority of sites have High-Quality Environmental certification (HQE). In Italy all buildings in the System have been awarded energy certification and subjected to sustainability assessments.